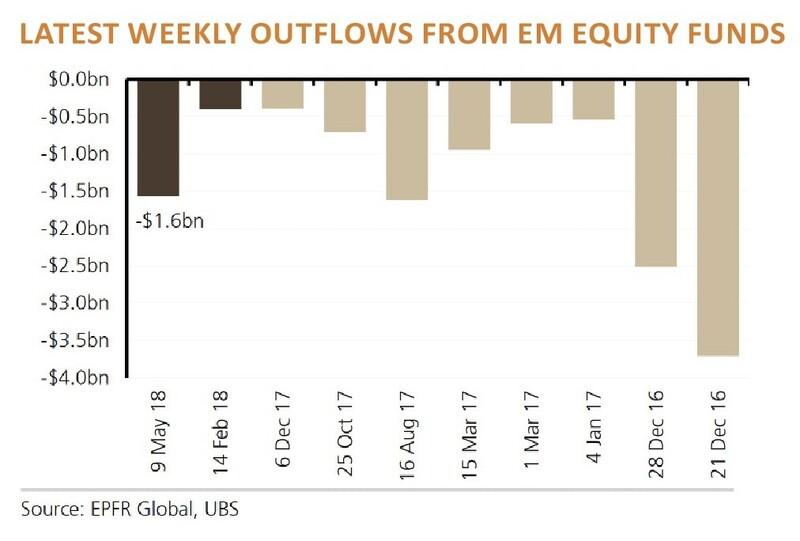 Data from investment bank UBS shows emerging markets funds saw the second-biggest weekly outflow since 2016 in the week to 9 May. This breaks a run of 11 weeks of inflows which has attracted $26.6bn into emerging market equities in the wake of the global market correction in February. Around 97% of the outflows were linked to exchange-traded funds. UBS notes ‘this fund type has been the major driver of inflows into emerging market equity funds through the current market cycle’. There were particularly significant outflows for Russia which saw its biggest weekly outflow in 14 months at $224m. Russia is being hit by US sanctions amid rising political tensions with the West. For the first time the US is directly targeting companies and individuals which are seen as being tied to Russian president Vladimir Putin. This has left Russia a less ‘crowded’ trade according to UBS. This might interest contrarian investors given the country is a potential beneficiary of the recent surge in oil prices. Is investor excitement over US gambling breakthrough premature? Could you get 6% yield from Royal Bank of Scotland? Is an early retirement possible anymore? Has Babcock kept up its recovery momentum?